It is appropriate that one of the first big temples to be built in America was dedicated to Ganesha, the Lord of Beginnings. The temple was consecrated in the New York borough of Queens on July 4, 1977. Though he is understood to be the son of Shiva and Parvati, all Hindus—Vaishnava or Shaiva—honor Ganesha. 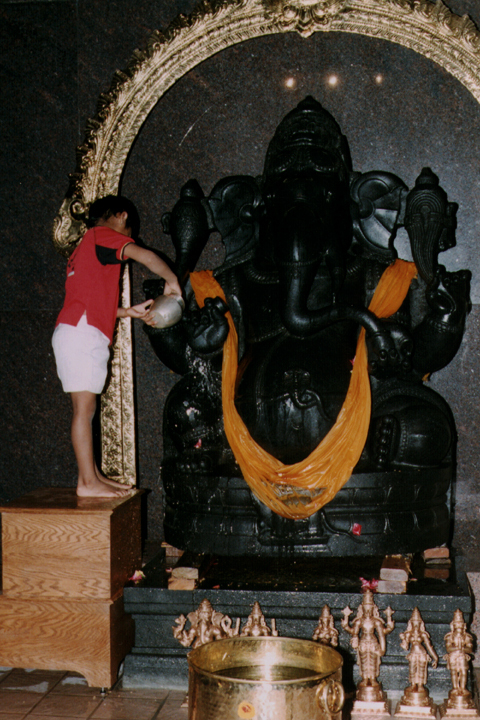 Indeed, every Hindu temple in America will have an image of him, for Ganesha is widely beloved. This elephant-headed Deity is the “lord of beginnings” and the “remover of obstacles.” His blessings are sought at the beginning of a journey, at the time of a marriage, and at the beginning of all rituals and undertakings. As the Divine scribe, Ganesha often carries a book and uses his broken tusk as a pen. He is honored by students at the beginning of the school year and as exams approach. His pot-belly betrays his fondness for sweets and when he moves about he rides, astonishingly, on a scurrying mouse. 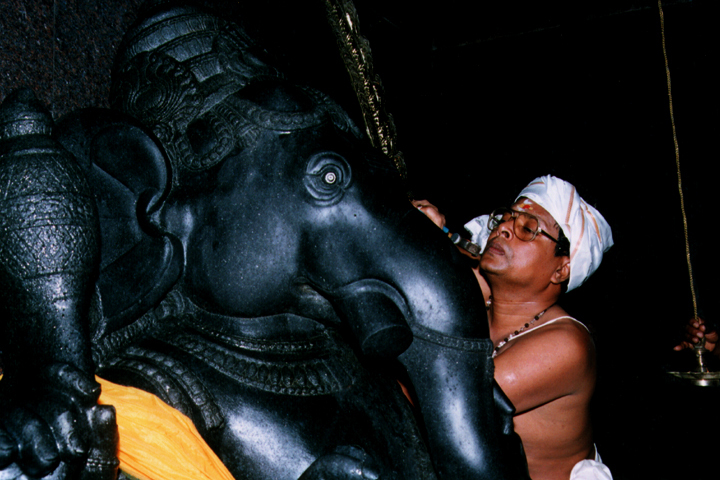 As the guardian of the threshold, Ganesha’s shrine may be near the doorway. In Queens, however, his shrine is at the very center of honor as the main shrine in the temple, while the periphery of the sanctuary has numerous smaller shrines to other Hindu gods. In Nashville, too, Ganesha occupies the central sanctum of a spacious new temple, built on a hillside in suburban Bellevue. To one side of this sanctuary is a sequence of shrines dedicated to Shiva and, on the other side, shrines dedicated to Vishnu. But Nashville Hindus—from the north and south of India and from all sectarian traditions—voted overwhelmingly to place Ganesha at the center of their temple. Toward the end of the summer is Ganesha Chaturthi, the annual festival of Ganesha. In many temples, during the days of Ganesha Chaturthi, clay images of Ganesha may be made and especially consecrated. In 1995 in Miami, Florida, the Hindu Temple Society made a two hundred pound clay image of Ganesha, elaborately painted by the women of the temple. At the end of nearly two weeks of special worship in the temple, Ganesha was asked to take his departure from this clay image and it was returned to the elements by immersing it in the sea, as would be done in India. The community gathered in festive procession and took the image of Ganesha on a gaily decorated flatbed truck to a beach north of Miami, where they immersed it in the ocean. Similarly in the San Francisco Bay Area, Hindus form a procession at the conclusion of Ganesha Chaturthi to carry their festival images of Ganesha to the sea. Their parade brings them to Baker Beach for the immersion at the end of the festival. In 1992, the mayor of San Francisco, for the first time, issued a city proclamation on the occasion of “Golden Gate Ganesha” day. In Queens, the festival of Ganesha Chaturthi lasts for nine days, during which more than 10,000 people come to the temple. The central murti of Ganesha is exquisitely decorated with flowers, sandalwood paste, and pearls. For the children, there is a “children’s puja” enabling them both to worship and to learn. Here, the climax and highlight of the festival is the Ratha Yatra, the “Chariot Pilgrimage,” when a portable duplicate of the great granite image in the temple, is taken out of the temple for a procession. It is placed on the ratha or “chariot,” which is decorated like a portable temple for a trip through the streets of Flushing. On all other days, the people come to Ganesha in the temple. Today, Ganesha comes to the people. Devotees by the hundreds lend a hand to pull the Lord’s chariot by its long ropes. There is dancing and chanting, the singing of devotional bhajans, all along the parade route. For some first-generation immigrants, it feels just like India on this day. But for the children who performed the puja, practiced making their offerings to Ganesha, and now skip along with the procession in excitement, this annual festival is a part of the America they know.